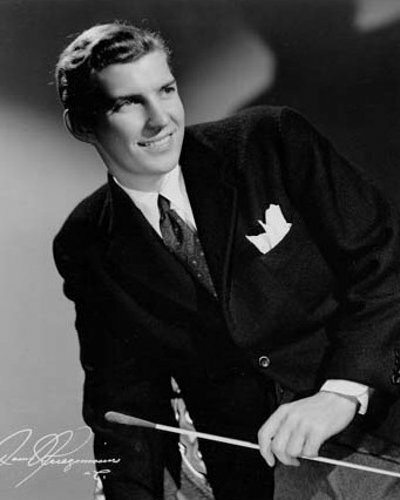 As a former singer for Hal Kemp, Bob Allen handled all male vocals in his own orchestra when it formed in 1941. Dottie Reed became female vocalist in January 1942, leaving by mid-year. Judy Starr, another former Kemp chirp, was initially considered to replace her, however Lynn Gardner ended up with the spot in September. When Gardner left in March 1943, Paula Kelly took her place. The Four Stuart Sisters provided backing vocals in mid-1942. Though Bob Allen is best remember today for his vocal work with Hal Kemp, Allen also led an orchestra of his own. Unfortunately, his band only recorded four songs with a very limited release on a very minor label before the American Federation of Musicians’ recording ban of 1942 began, so any musical record of its existence is minimal. While it was a competent orchestra that attracted the attention of labels and movie studios, it didn’t survive long enough to reap the benefits it earned once the strike ended in November 1944, breaking up when Allen was drafted in January of that year. Though he was reclassified 4F, Allen, in debt to the tune of $50,000, signed with Tommy Dorsey as a vocalist rather than try his hand at organizing another group. See Bob Allen’s entry as a vocalist for a complete biography and a more detailed history of the band.